Hiya guys! It's almost time to TGIF and kick back to the weekend. I am like counting the seconds that's how crazy desperate I am to relax. But regardless of how hectic week has been, I'm still so excited because I got to try out a new-to-me brand, Night Owl Lacquer. 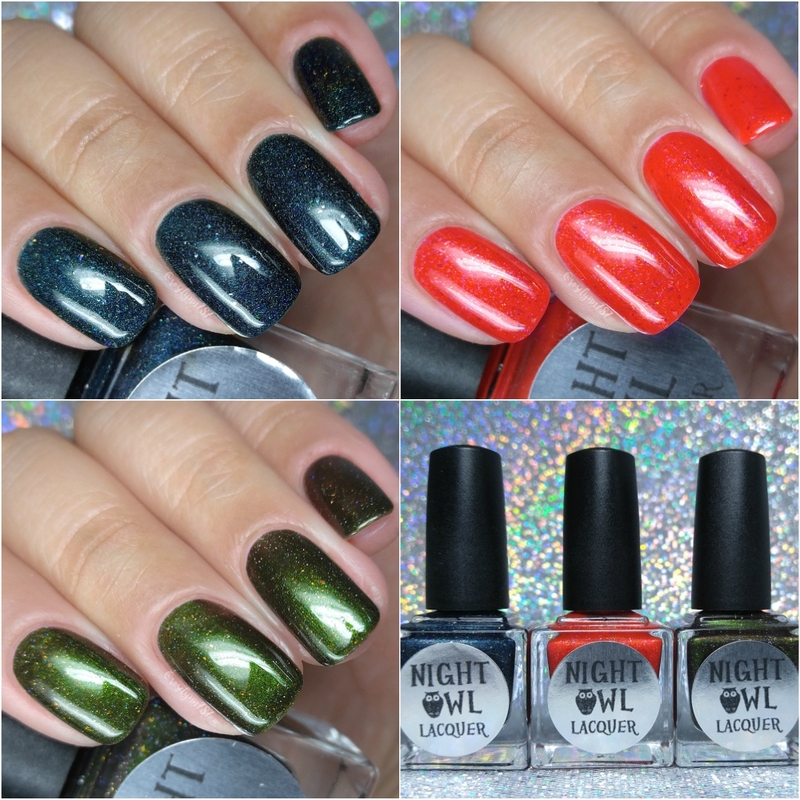 Today I'm sharing swatches for the Gone Camping Trio by Night Owl Lacquer, which consists of three shades in different hues and finishes. Of course I mentioned the name of this collection to my husband, whose been dying to take me camping since the day we met. And he looks at me with that cheeky smile and ask if this means we can go camping. You know since I just love camping inspired shades it must be I'm down for the wilderness. Me... a total city girl scared of bugs. Yeah, that's gonna have to be a no from me. Haha. I know some of you ladies must feel me on this, so I encourage you to bask in this collection with me! Let's go ahead and get to the swatches! The Gone Camping Trio by Night Owl Lacquer will be releasing on Friday, August 25th at 8PM MDT. Each full-size shade will retail between $9 to $10.50, depending on the finish. The entire full trio will be priced at $27.00. Shooting Stars can be described as a deep velvety blackened blue linear holo with silver micro shreds and silver holographic shreds. This shade has such a strong holo finish, I really wish I could have captured it in photos. But as you guys know my mani cave is literally a cave with no windows and I work at night. 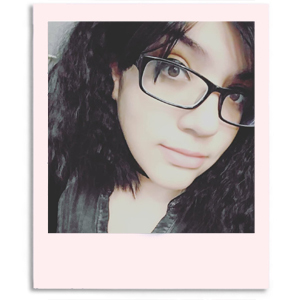 I may or may not be a creature of the night, haha. The formula has a really smooth and opaque application, though not enough to be a one coater. The consistency is nicely balanced, not too thick or too thin. It ends up drying to a high shine semi-textured finish, but smooths out perfectly after topcoat. And there was no staining on removal to either my cuticles or nail bed. Shown in two coats and sealed with a glossy topcoat. Glowing Embers can be described as a bright fiery red full of bright blue and gold sparks, red-gold micro flakies and charcoal flakies. I feel like I'm going to keep saying this throughout the review, but photos really don't do it any justice. The amount of sparkle and flakies in this shade is just the right amount to give it a world of depth without too much clutter. Plus we can't forget about the squishy finish effect, I will never get tired of the squish! The formula has a nice amount of opacity, but does lean on sheer like a jelly. There is a slight visible nail line even after some layering, but it's for the most part very faintly noticeable. Consistency wise it's very balanced, which I was not expecting but loved. It dries down to a super high-shine and smooth finish. Once again, I experienced no staining on removal to either my cuticles or nail bed. Shown in two to three coats and sealed with a glossy topcoat. May The Forest Be With You can be described as a duo chrome that shifts green to brown with gold to green shifting UCC flakies and scattered galaxy holo micro glitters. Last, but not least we have my favorite among favorites. This shade is stunning beyond what words can described. I literally drooled over this shade, not kidding. It wasn't cute, just ask my husband. 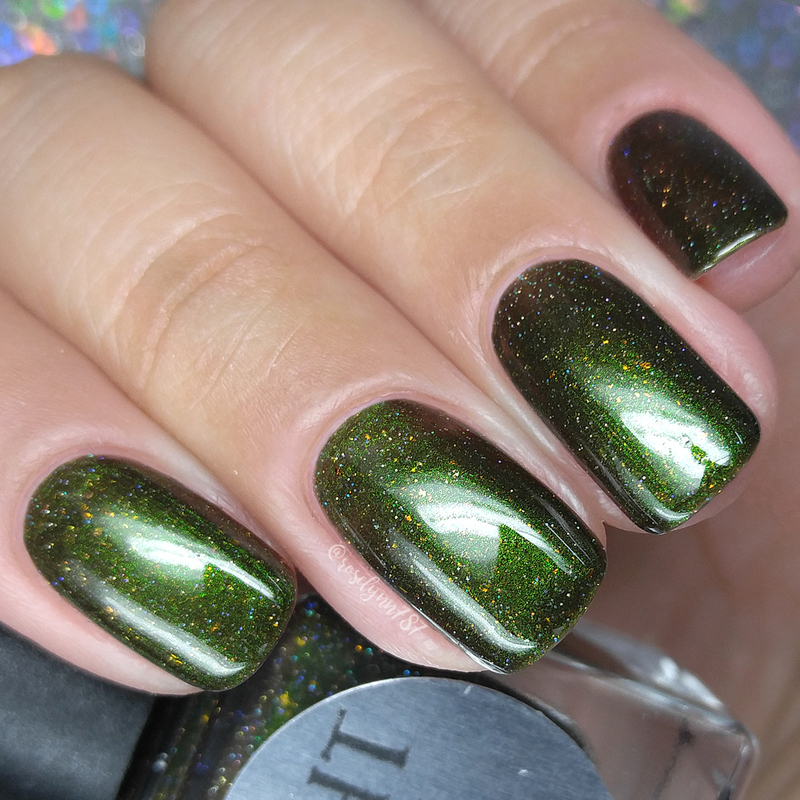 But in all seriousness, I'm not a fan of green polishes in most cases but this one won me over like nothing else. Very breathtaking against my skin-complexion as well.... Let me stop before I drool again. The formula has a sheer initial application, but builds up really nicely for full coverage. Again with this shade we have perfectly balanced consistency making this shade so easy to work with. There are some minimal brush strokes in the finish that blend out mostly after topcoat. Shown in two coats and sealed with a glossy topcoat. Overall this trio completely blew my mind away as a first time impression! Normally here's the part where I tell you my must-have pick, but honestly the entire set is a must-have. Not to mention this trio has definitely made this brand something to look out for to me from now on. The formulas throughout were just so spot on and easy to work with, which is a pretty big feat considering these are all different finishes. Definitely a big thumbs up (and pelvic thrust) from me! But I don't want to sound like I'm raving too hard, so tell me what you guys think of these shades! 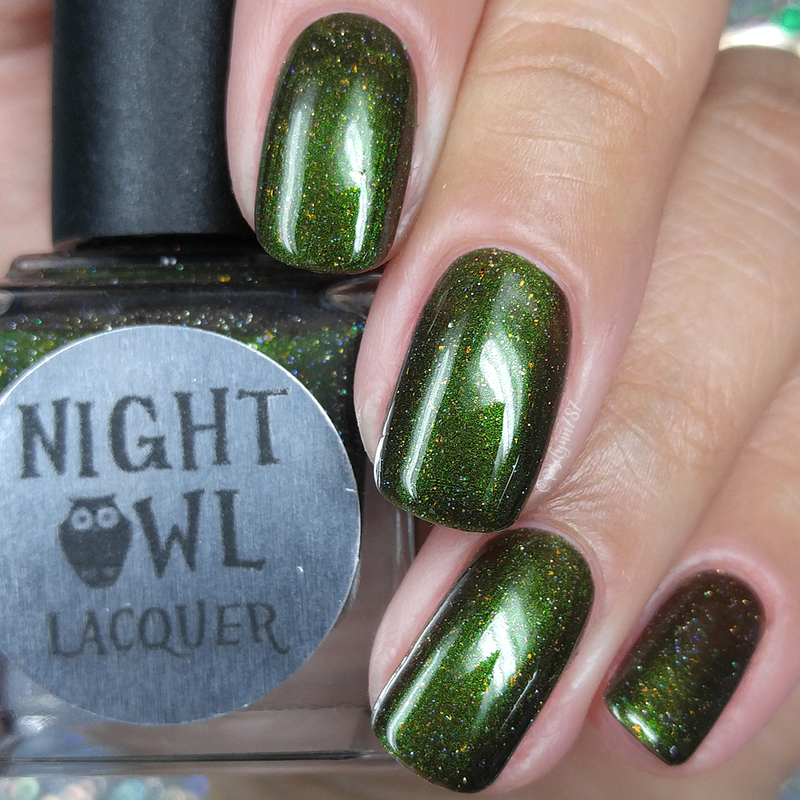 To recap, Gone Camping Trio by Night Owl Lacquer will be releasing on Friday, August 25th at 8PM MDT. Each full-size shade will retail between $9 to $10.50, depending on the finish. The entire full trio will be priced at $27.00. I'm like that too! Not a fan of bugs or camping. This trio is beautiful! Love both the name AND colour of May The Forest be With You!